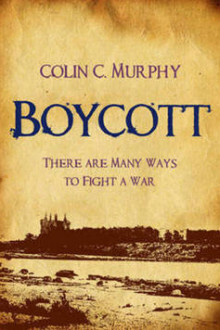 On the surface, Colin C. Murphy’s historical novel, Boycott, is about the passive resistance campaign of late 1880 by the Land League against land agent Captain Charles Boycott of Lough Mask Estate in County Mayo, a campaign that gave rise to a new verb ‘boycott’ in the English language. However, the book is as much about the Great Famine of three and a half decades earlier, and the overhang of passion and suffering from the 1840s calamity. The catastrophe of the famine seeps through the book, primarily via the narratives of the novel’s other main characters – the brothers Owen and Thomas Joyce – and their contrasting responses to the intolerable tragedy their family endured in the famine years. The reader is presented with scenes of famine horrors including cannibalism, and one sight above all others will stay with Owen Joyce forever: ‘The image of the mother dead and the screaming child suckling on her cold and lifeless breast was impossible to bear.’ The first half of Boycott cleverly interweaves chapters dealing with the famine experiences of the Joyce brothers with sections on the 1880 Land League campaign. The historical basis of this book is widely and thoroughly researched from the evidence of the comprehensive bibliography. The factual press and book extracts which introduce each chapter root the story in its historical context, as do the written extracts of the work of visiting journalists and writers such as James Redpath and Bernard Becker. The writer’s notes on where he diverges from the historical facts give and intriguing insight into how the craft of the novelist builds on the historical story. In Murphy’s narrative, Charles Boycott’s relationship with Mary, his only child, reveals the humane and sympathetic side of his character. We are told in the author’s notes that while there is no record of the Boycotts having had a daughter, and that most biographies refer to them as childless, an Achill Island death certificate was issued for a Mary Boycott who died at the age of nineteen. The writer raises the interesting possibility that Mary was the daughter of Charles and Annie Boycott. This is a large book of 570 pages where the story gallops along and keeps the reader attentive and engaged with its lively, vivid, and varied writing. At its heart, the book touches on the still topical issue of whether the Irish famine can be described as British genocide, an issue about which Thomas Joyce is in no doubt: ‘The only reason the bones of millions are rotting out there in the fields is because that’s exactly what the British intended.’ What we get from this book are two very different responses to the famine tragedy: one (Michael Joyce)whose howl of pain and hatred courses though his entire life; the other (Owen Joyce) who channels the same emotions into the powerful political passivism of which Captain Charles Boycott was at the receiving end. Review by Patricia Byrne. Patricia Byrne’s narrative nonfiction book The Veiled Woman of Achill was published by the Collins Press in 2012.